The black box above is an intervalometer to work with Nikon cameras (specifically, any cameras that work with the cheap ML-L3 remote). It has two external controls: a power switch and a knob. You rotate the knob to choose the interval period on the screen, and click it in to arm the intervalometer. Clicking it again and briefly holding it until the screen lights will disable it. Which sounds simple enough, I suppose. I mean, it’s simple to explain. But when I began, I wasn’t even sure if I’d be able to make this – which was part of the adventure. My commit messages tell me I’ve been working on it for over a year. It’s not, to be honest, a year-long project; it’s just how it came about, scraped together in moments between work, and I wanted to write some notes on the project – both what it is, and what I learned from it. Like many of my technically-savvy peers, I had an Arduino in a desk drawer. I’d used it for more than just making an LED blink – a few little experiments in serial communication – but I’d not exactly exploited its full capabilities. 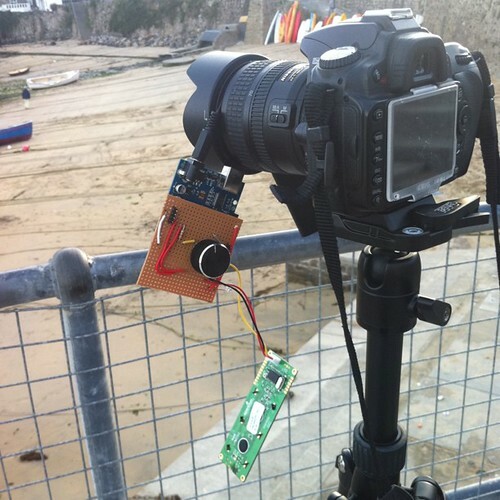 One day, I had a thought: I wanted to experiment with time-lapse photography, and had a small IR remote for my camera. Perhaps I could make something computer-controller to enable this? Not a full-size computer, that’d be ridiculous. But I could perhaps make something with a small microcontroller – like my Arduino – wired into a spare remote, firing regularly. That smelled like it was within my reach: a little user interface and a timer. 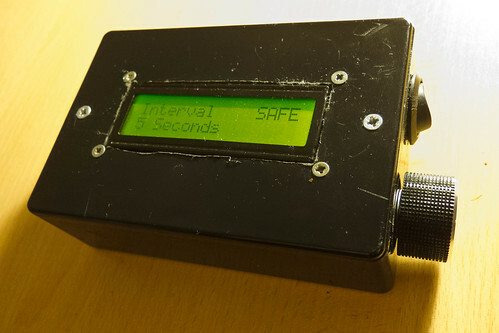 I wanted to use a rotary encoder as the interface: it seemed much more natural than stabbing up and down with buttons. I wanted to use a small LCD screen in the project: I’d never worked with one, and it seemed like the simplest UI for the project. Also, there was a fun design challenge in fitting clear UI into 16×2 characters. And that seemed like a starting point. This felt like a huge leap. Somehow, making rudimentary computer graphics in tools like Logo or Processing had never captured my imagination – perhaps because I felt I ought to be able to do that. Working in a medium I was very unfamiliar with as a developer (but saw every day in my life) and producing output felt strangely empowering. Of course, it was made much easier by the Arduino ecosystem, which is ideally suited to glue-programmers like myself. The SerLCD library did a lot of the heavy lifting; I just had to work on the implementation, and some details around making sure I put enough pauses in the serial routine. Next, I worked on the encoder. This, again, was enabled by other people’s code. Rotary encoders aren’t like knobs – they spin forever, and as they pass a pair of contacts, emit Gray code from a pair of pins. You just have to read that code as it passes a pair of pins, and translate it into up/down signals. It wasn’t long – again, thanks to the magic of copy and paste, primarily – before I had the encoder being read. I then added some detail to its implementation, where setting the timer past 90 seconds switches the device into minutes, which increment by 1, until it reaches 15 minutes. Why 15? It’s the maximum length of time my camera would stay on without any IR input before it goes to sleep. Finally, we just need to rig up the IR interface. I was, when I began, ready to dismantle an ML-L3 – but it turned out I didn’t need to go that far. 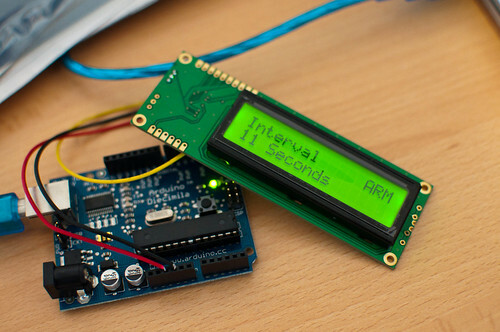 There’s already an Arduino library for that exact functionality. NikonIRControl takes a single IR LED on a pin, and sends it the same sequence of pulses as the ML-L3 does. So that ended up being fixed in software, rather than hardware. (In the final version, I replaced it with MultiCameraIRControl, in part because it’s now much easier to make this work with many brands of camera). Along with the hardware, there was a bunch of code to be written. This was mostly straightforward, although finding the best way to write timing routines was the most complex part of it, and in the end, I relied on the TimedAction library, which abstracts a lot of what I’d tried writing longhand out. The other thing I discovered was the ability to compile multiple files at once into an Arduino sketch – available through tabs in the IDE. This helped a lot with clarity. Really, though, the code is a lot of other people’s libraries or examples, all glued together with some UI and specific functionality on my part. That is the sort of code I end up doing a lot of: gluing other things together. After a few months of the odd evening here and there, I had the whole thing working on a breadboard. The next thing to consider was packaging it up. I made a small shield out of stripboard and mounted it on top of my Arduino mini: a connector jack for the LCD, the encoder and LED soldered into the stripboard, and a battery pack to prove that the USB cable wasn’t doing anything. That really proved it worked: not just the electronics, or the software, but the intent. The goal was not making electronics; the goal was making a timelapse video, which the electronics enabled. And here we were: a timelapse video. Of course, it wasn’t finished. My friend Matt Brown saw an early verison of this, and said that it needed to be in some kind of sturdy, industrial black box. And he’s right, really. 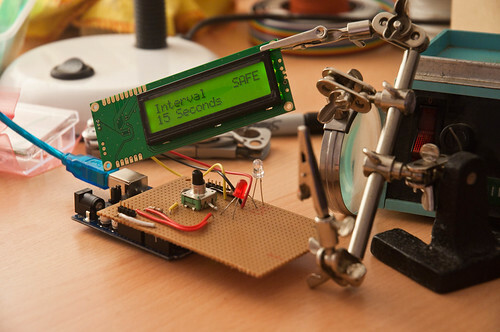 Something rigged up on your desk on a breadboard is nice, but it’s not finished. Frankly, that dangle of a shield hanging from my lens was nowhere near finished either. There is value in just doing something, but there is also real value in finishing it. That doesn’t mean selling it, or productizing it, or anything as over-the-top like that. Just get it into a stage where somebody else might recognize it for a thing. So I started thinking about how to package it, because that would be what really made it a thing, and not just a tangle of wires. The limiting factor on packaging was the LCD screen. I was using a Serial LCD, and the serial componentry was hanging off one edge, extending the length of its PCB. I should have probably used a seven-pin LCD interface, but instead stuck to the serial interface. I took a regular seven-pin LCD, and used this Sparkfun Serial Backpack to convert it to serial whilst taking up less space. Next, I decided there was no point running it from a full-size Arduino, so bought a Pro Mini, and set about re-installing the code there. Of course, that meant flashing the Pro Mini, and rigging the whole circuit up on a breadboard, checking it still worked, before moving to a custom circuit. With that done, I made a stripboard for it. (Yes, I keep using stripboard, because it works for me. I don’t know much about PCBs or Eagle, and that would mean this thing was never going to get finished). I would mount the Pro Mini in the middle of this stripboard, and then attach components around it, breaking the tracks where appropriate, to make a stripped-down board. Crucially, I didn’t directly solder anything other than the battery jack leads. Rather, I put female header sockets onto the board, for the Pro Mini and all the components. Then, I attached the components with hires ending in male headers. That way, I could remove/install componentry easily, and also remove the Pro Mini easily to reflash it with new software. This turned out to be one of my smarter moves. Finally, there was the matter of the box. Probably my weakest point: I am somewhat clumsy and useless with my hands. Also, I don’t really have any workshop facilities, so drilled the holes for power and encoder, along with the hole for the LCD, with files and a Dremel-a-like. This made a horrendous, ragged mess, and I envy people with CNC facilities or a decent mill. I did use my Dad’s workshop to mount the LCD, which means it at least got some counter-sunk, well drilled holes. Oh, for a pillar drill. Finally, I just had to piece it together, testing the final version of the code, and plugging components in one at once. It is strange to say “remarkably, everything worked” so much, but hardware is so strange and fincikity I always expect it not to. Also: I was aware throughout how out of my depth I was, and yet I always bobbed back to the surface. Squeezing the box shut, the serial backpack on the screen impinged a bit on space, but careful board and battery placement made it shut. And that was that: a working, solid box, that did one thing, with software I’d written and hardware I’d made. More to the point: it was finished. This project taught me a few values. I discovered with this project is the way that Arduino reminds me of Rails: it directly values productivity of the designer/developer, and you pay for that convenience. This project could have been made out of discrete components, or out of a much simpler AVR chip, but it’d have taken me a lot of knowledge and experience. 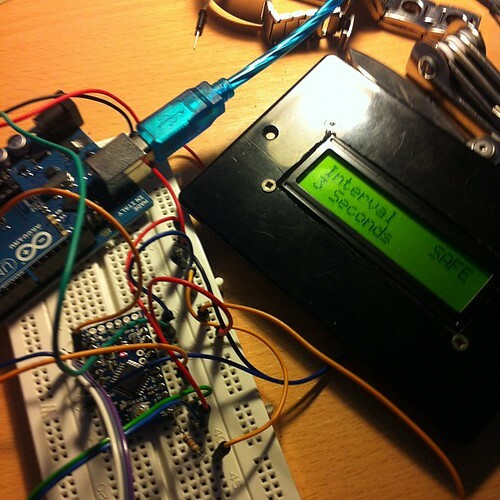 I pushed all the complexity into software, and embraced the Arduino platform. So it may have cost me £20 for the Uno, and about that for the final Pro Mini, as opposed to a few pounds for a bare microcontroller – but I saved myself effort. Still, it’s worth remembering that these solutions are in turn made out of other existing hardware, and that one day, that might be a better solution. The project taught me the value of thingness: of completing something so that it’s an artefact other people can recognise and identify. The box-with-a-lid is a huge part of that. It stops it being a bunch of wires, something I explain as “an Arduino doing X”, and it becomes an Intervalometer. It becomes a thing. Foster is talking about manufactured products, of course, which I’m not; I’m still much earlier along the curve. But Matt Brown’s point, a year ago, to make sure I completed it, not just leaving a pile of wires sticking out of a breadboard, was a challenge I felt it worth rising to – and I’m glad I did. Perhaps most importantly, though, it reminded me of the huge value of making something you saw in your head. It’s vastly rewarding to make an idea that you originated; to solve a problem that you yourself had. I’ve always found that I learn new things better when I have a reason to. Every programming language I’ve tried to learn without something I myself wanted to build with it – I got nowhere. The second I have an itch I need to scratch, I’ll bat through tutorials and understand them, not to mention start trying to implement that thing as soon as I can. This, I think, is hugely important. It’s why I think an important part of learning to code – for kids, or for adults – is achieving something you wanted – or needed – to do. It’s vital to understand that making, in software, hardware, or materials, is something you do unprompted, to solve problems, and not always knowing where the journey will take you. You don’t just implement rote linked lists, or bubble sorts, or debounce circuits; learning from examples is important, and often all one can do to begin with, but it’s not what the work is about. To learn to make things, you have to Make your own Things. You have to travel a complete path. It doesn’t just make the end more rewarding: it makes the whole journey more rewarding. I wonder if that’s why a lot of Arduinos are in desk drawers, an LED wedged into pin 13: the platform is exciting and interesting, but there was never an itch. When that itch arises, take that board out of the drawer and scratch it. It is difficult, but it is within your abilities, and you will learn a lot. I did.